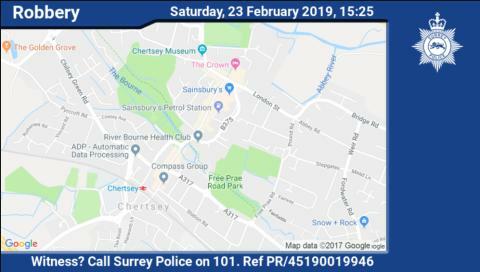 Two men from Chertsey have been arrested after a 79-year-old woman was robbed in Chertsey on Saturday afternoon (23 February). The men, aged 27 and 30, have been arrested on suspicion of robbery. They are currently in police custody. The robbery happened just before 3.25pm on Guildford Street, near the library. The woman was approached from behind and her handbag was snatched, causing her to fall to the ground. The victim was taken to hospital with a broken arm. If you saw what happened or you have any other information, please contact Surrey Police on 101 (999 in an emergency) or http://surrey.police.uk/TellUsMore , quoting reference PR/45190019946. You can also give information, 100% anonymously, to the independent charity Crimestoppers on 0800 555 111; or through their anonymous online form: https://crimestoppers-uk.org/ .